Mark Landis could be described as a genuine work of art. His Southern accent and genteel manner recall Truman Capote at his grandest. Landis occasionally masquerades as a priest, sips brandy from a Phillips’ Milk of Magnesia bottle and has dedicated much of his life’s work to a nonexistent sister. He is also one of the preeminent art forgers and con men of our era and the subject of Art and Craft, a captivating, compassionate and often humorous documentary airing on PBS’s POV(Point of View) series as a special presentation on Friday, Sept. 25, 2015 at 10 p.m. (Check local listings.) The film was an Official Selection of the 2014 Tribeca Film Festival and International Documentary Film Festival Amsterdam and was named a Top 5 documentary by the National Board of Review. POV is American television’s longest-running independent documentary series and the recipient of a 2013 MacArthur Foundation Award for Creative and Effective Institutions. Directors Sam Cullman (co-director of the Oscar®-nominated If a Tree Falls) and Jennifer Grausman (Emmy®-nominated Pressure Cooker) and co-director Mark Becker (Independent Spirit-nominated Romántico) tell the story of an enigmatic, vastly talented and sometimes troubled man who, through hard work, perseverance and almost majestic chutzpah, fooled the art world for nearly a third of a century. Unlike most art forgers, Landis was never in it for the money. He gave away his forgeries. One of his primary motivations, however, was universal: he wanted acceptance and respect. Art and Craft will likely earn him both, and perhaps confer cult status on the mild-mannered 59-year-old. Born in 1955 in Norfolk, Va., Landis was the only child of a naval officer and beautiful mother. His father’s death triggered a nervous breakdown when Landis was 17, which resulted in an 18-month hospitalization and an early diagnosis of schizophrenia. His mother’s later death (he moved into her Mississippi home after Hurricane Katrina to care for her) deepened the devastation. But Landis had one thing going for him: a brilliant talent for copying art that began to blossom at around age 8 and would eventually be affirmed by his stunningly successful career as forger and “philanthropist.” Over the course of 30 years, Landis successfully presented his fakes as the original work of Paul Signac, Pablo Picasso and Dr. Seuss, among many others. All told, he has donated hundreds of works over the years to a staggering list of institutions across the United States. Of course, Landis’s genius was not confined to forgery alone. He was also a formidable con artist, often posing as a Jesuit priest and sometimes presenting identical copies of forgeries to different museums, usually to honor the memory of his deceased parents, or a nonexistent sister. In another delightful touch, he used materials from big-box retailers to create his forgeries. The first scene in Art and Craft shows Landis picking up materials at a Hobby Lobby store; he had a penchant for frames bought at Walmart. He usually drove to museums in a red Cadillac with big-band music playing on the stereo. Landis also has a sly sense of humor, which is on display throughout the documentary. “Nothing’s original under the sun,” he intones early on, and as if to suggest what he has in mind for the art world’s many experts, the first donation mentioned portrays the crucifixion. Eventually, however, the art world would attempt to return the favor. Matthew Leininger, a former registrar at the Oklahoma City Museum of Art, became suspicious of Landis and began looking into his history as a donor. Just as Landis fed an obsession for going on “philanthropic sprees” to museums across the nation, Leininger took the con very personally and soon developed his own obsession. “He messed with the wrong registrar,” Leininger says with a slight snarl. Leininger’s pursuit of his nemesis adds a cat-and-mouse element to Art and Craft. Leininger exposed Landis in 2008, though the story was far from over. Because Landis did not charge for his forgeries, he had not technically committed any crime, and so avoided prosecution and possible incarceration. Exposure also brought fame, though Landis discovered, like countless people before him, that fame is a double-edged sword. When director Jennifer Grausman saw the first of the stories on Landis and shared it with director Sam Cullman and co-director Mark Becker, the three were hooked. 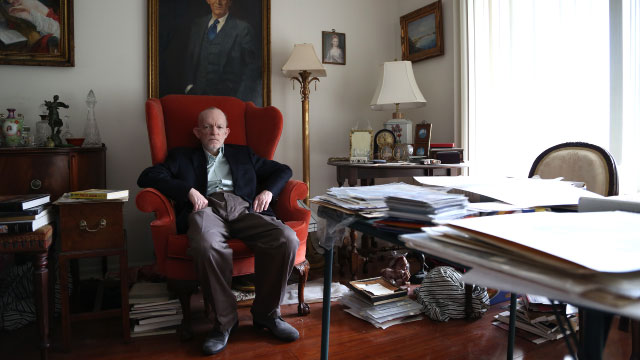 “The piece described a talented art forger who wasn’t motivated by money, but instead donated his work to institutions across the country for nearly three decades,” says Grausman. The filmmakers found a complex man with complex motives, but one who was also driven by a universal desire borne of his unique circumstances. Isolated his whole life by his struggles with mental illness, Mark Landis had forged a 30-year con that “allowed him to regain control and finally be given respect,” Cullman concluded. In his own way, Landis was pursuing happiness and a sense of purpose. And along the way, he created something of a masterpiece, as Art and Craft engagingly chronicles.